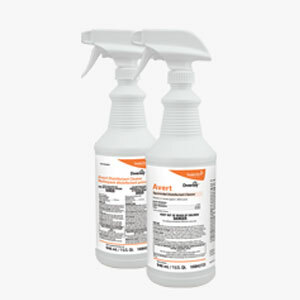 Diversey Avert Sporicidal Disinfectant Hard Surface Cleaner SKU#Diversey-100842725 - 1 Dozen 32 Oz Spray Bottles. Avert Sporicidal Disinfectant Cleaner cleans, disinfects, and deodorizes in a single step (no rinsing required), and is ideal for use on hospital-grade hard (nonporous) surfaces including stainless steel, porcelain, glass, glazed ceramic, plastic... in healthcare facilities. May be used to clean and disinfect sinks, faucets, fixtures, bathrooms, restrooms, tubs, and showers. Bleach-based formula means no quat binding concerns and 12,500ppm chlorine exceeds CDC, SHEA, APIC & AORN recommendations. Sporicidal - effective in 4 minutes against Clostridium difficile (C. diff) spores. Effective in 1 minute against a broad spectrum of pathogens including gram positive bacteria, gram negative bacteria, antibiotic-resistant bacteria, enveloped viruses, non-enveloped viruses and fungi. 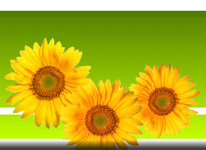 Pale yellow liquid has pH 12.5, low-odor formula with fresh clean chlorine scent, 1 year shelf life. Coarse trigger sprayer allows easy application to hard, nonporous, surfaces. No rinse necessary - simply wipe surfaces dry with a dry paper towel, dry disposable wiper, lint-free cloth, microfiber cloth, or sponge. 32 Oz (946ml) RTU Spray Bottles, 12 Bottles per Case. Dobmeier Discount Janitorial Cleaning Equipment & Supplies Experts can help You get exactly the right equipment, parts, or supplies.